110 new American citizens pose after their naturalization ceremony at NASA's Kennedy Space Center in Cape Canaveral, Fla. The July 1 ceremony, representing people originally from 36 nations, was the first such held at a NASA site. It may seem like one small step for NASA, but it's one giantleap for more than 100 people making the jump to becoming U.S. citizens today. For the first time ever, a naturalization ceremony for newAmericans was held at NASA's Kennedy Space Center in Florida, launching groundof the spaceshuttles, just days before the U.S. Independence Day holiday on July 4. 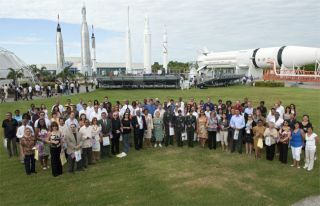 "We're very proud to welcome 100-plus new Americans tocitizenship here at the KennedySpace Center," NASA spokesperson Allard Beutel told SPACE.com beforethe ceremony. "We've never had this at NASA before. It should be a prettydecent way to start the Independence Dayholiday." The ceremony, held at 9 a.m. EDT at the Kennedy Space CenterVisitor Complex, was one of 55 ceremonies occurring across the country andaround the world from July 1 through July 6. A total of about 3,800 newcitizens, some of whom are U.S. service members, are being sworn in. U.S. Citizenship and Immigration Services is hosting theevents and conducting the Oath of Allegiance.
? "From our point of view, there's an obvious tiebetween America'sspace program and U.S. citizens," Beutel said. "This is acivilian space program ? it always has been and remains that way. Spaceexploration has always been a bridge between different nationalities."